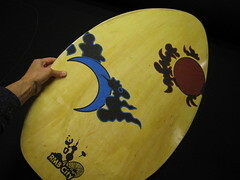 The Skimboard Interface is a custom interface built for the game Surf RMB City by artist Cao Fei. The interface was commissioned by the Museum of the Moving Image for their opening exhibition in 2011. 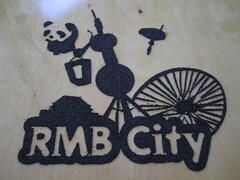 RMB City logo and skimboard graphics by Cao Fei. 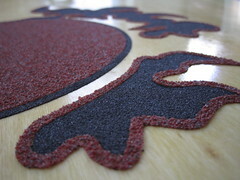 The Skimboard Interface is made up of six handmade textile pressure sensors that are embedded within layers of felt mounted beneath a commercial skimboard. 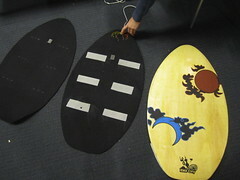 These pressure sensors can detect the weight and position of somebody standing on the skimboard. 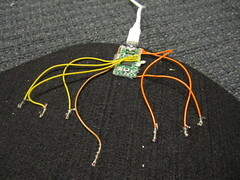 All six sensors are connected to a small programmable HID (Human Interface Device) module called the Teensy 2.0. 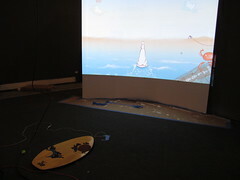 The Teensy is programmed to read the sensor data in order to detect whether somebody is standing on the skimboard and interpret if they are leaning left or right. 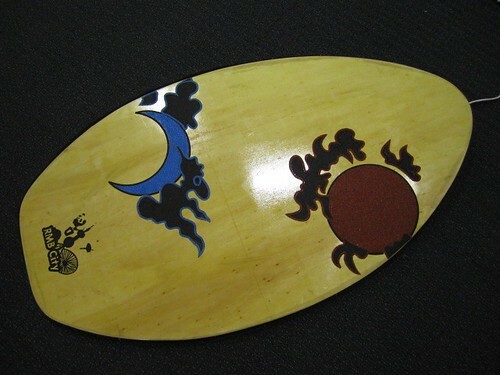 This information is then mapped to different keyboard strokes in order that the skimboard interface can control the game.